Visitors planning a trip to the beach can kit themselves out in the latest attire at this swimwear and water sports store at Dockyard. The 2,000 square foot store is the place to come for trunks, shorts, bikinis, sandals, flip-flops, snorkelling gear, skateboards, skim boards, sunglasses, and accessories. Brands stocked include Roxy, Oakley, Penny, Billabong, Quiksilver, and Hurley. Summer opening hours are 9 am to 6 pm, every day of the week. The store is situated on Camber Road at Royal Naval Dockyard, right next to the Dockyard Pharmacy. 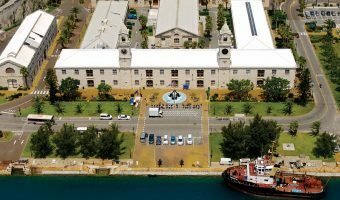 It’s just a 5 minute walk from the cruise ship docks at Kings Wharf and Heritage Wharf. There’s another branch of Makin’ Waves in Hamilton. Their shop in St George closed in 2009. Map showing location of Makin’ Waves – Dockyard. Click here for a detailed map showing all points of interest. Comprehensive guide to Dockyard. Includes details of the cruise ship terminals, things to see and do, shops, places to eat and drink, events, and an interactive map.